It’s Time for the Harmony Blanket Knit Along! Welcome to the home page for the Harmony Blanket, a sampler blanket by 13 knitting designers that will be released from January through November, 2018 as a knit along. In this post, you can find all the information you need about how to follow along, as well as regularly updated links to the KAL patterns. This post contains affiliate links. I may receive compensation (at no added cost to you) if you make a purchase using these links. Yarn for the Harmony Blanket patterns was generously provided by Lion Brand. I’ve teamed up with Pia from Stitches ‘N’ Scraps, Joanita from Creative Crochet Workshop, and 10 more guest designers, to bring you 48 free knitting patterns for 6″ (15 cm) squares. Every Thursday from January through November, 2017, we’ll share a free square pattern with you. 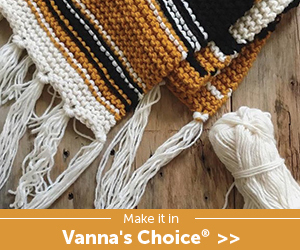 Lion Brand has generously provided us with yarn for the knit-a-long, so all of the patterns will be made with Lion Brand Vanna’s Choice yarn, a medium (worsted, #4) weight acrylic yarn. I’m decided to go with a retro theme when I picked out my colors. I’m using (from left to right) 173 Dusty Green, 158 Mustard, 306 Tangerine Mist, 130 Honey, 135 Rust, and 124 Toffee. Here’s a little sneak peak of my yarn. I hope this gives you a little inspiration for your own version. Update: Tangerine Mist has been discontinued. You can join in by knitting each of the patterns as you have time. If you’d like to chat with other knitters, join our KAL Corner Facebook group or visit this thread in the Underground Crafter Ravelry group. Be sure to visit the participating designers so you can get see more of their great designs! The links below will be updated throughout the KAL to direct you to the pattern. Each pattern will also be shared in the KAL Corner Facebook group, in this thread in the Underground Crafter Ravelry group, and via email to the KAL Corner email list. Don’t forget to sign up for the KAL Corner email list to get a weekly email when a new pattern is available. Each of the 48 square patterns will include a garter stitch border as well as edge stitches on each side to make it easier to join your squares. There will be some variety in the amount of yarn used for each square (depending on the stitch pattern and the designer’s gauge), but it’s safe to say that each square will use somewhere between 35 yd (32 m) to 50 yd (46 m) in Lion Brand Vanna’s Choice yarn, a smooth, medium (#4, worsted) weight yarn. As an example, for a 48-square baby blanket, you would need 2,040 yd (48 squares x 42.5 yd). If you used Lion Brand Vanna’s Choice Solids, which have 170 yd in each skein, you should be prepared to use 12 skeins (2,040 yd/170 yd rounded up). How do you know how many squares you need for your blanket? Download the planning worksheet below. It includes a chart with different blanket sizes and how many squares you’ll need for each size. I used the long tail cast on and the “standard” or “chain” bind off for my squares. If you’re a newbie knitter, these videos by Lion Brand Yarn demonstrate those techniques. You are welcome to use any cast on or bind off method that you prefer – it’s your blanket! My squares measured 6” (15 cm) when I used Lion Brand Vanna’s Choice yarn (a smooth, medium weight yarn) along with US-7 (4.5 mm) knitting needles. However, with 13 designers, a variety of stitch patterns, and different tensions and gauges, it’s possible that your squares will be a little bigger or smaller. You may want to block your squares before assembly. Many knitters block everything, others block only sometimes, and the rest never block. The garter stitch borders will help your squares lay flat, so if you hate blocking, you can probably avoid it. But, you may find that your blanket looks more even and is easier to assemble if you do block. Blocking can be particularly helpful for very textured squares. I used the spray blocking method for my squares. You can learn more about blocking in this post. Make sure to leave a yarn tail at least 6” (15 cm) long on your cast on edge of each square. Weaving in ends keeps your work from unraveling. This is especially important for blankets, which usually get a lot of wash and wear. Weaving in ends also makes your projects look neat. Very Pink Knits has a video demonstrating how to weave in ends on garter stitch (like the borders for this pattern). Waiting until your project is finished to weave in your ends usually creates a lot of anxiety! Weave in the yarn from your cast on edge as you finish each square, and it won’t be as tedious. If you leave a yarn tail at least 3 times the length of your square on the bind off edge, you can use it to join your squares together (so don’t weave it in yet). Seam your squares as you finish them, randomly, or spread them out after finishing all 48 (or more) to choose the layout you like best. If you don’t have a lot of room to lay out your squares (or if pets or children will promptly move them) take a picture of each square and use a free photo collage website, like BeFunky, to help you plan your layout. I recommend using the yarn tail from your bind off edge and any one of these seaming methods to join each square together. Photo tutorial for joining squares with the slip stitch. Leave a yarn tail approximately 3 times the length of your square after you bind off for seaming. Join squares together across a row using the yarn tail. After each square is joined, weave in the remaining yarn tail. Once each row is formed, cut a long strand of yarn (approximately 3 times the length of the row) and use the same seaming method to join the rows together. After each row is joined, weave in the remaining yarn tail. Once the blanket is assembled, weave in any remaining ends. If you’re joining us for the KAL, feel free to use this button for your Ravelry project page or elsewhere on social media. We can’t wait to see what you come up with!